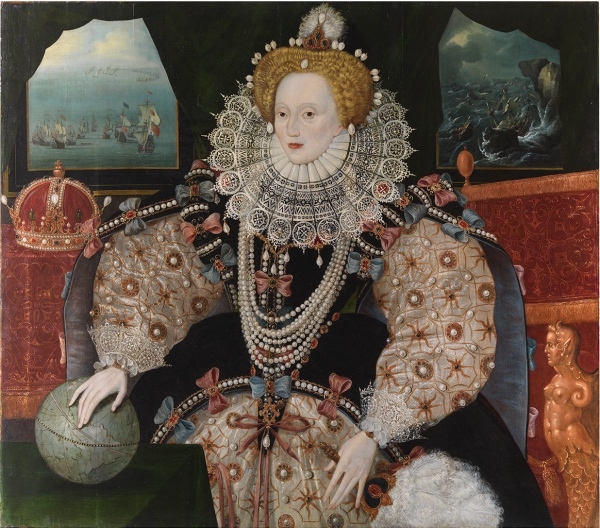 Saved for the nation following a public appeal by the Art Fund and Royal Museums Greenwich in 2016 and subsequently having undergone an extensive conservation and restoration process, the ‘Armada Portrait of Elizabeth I’ now hangs in the 400-year-old Inigo Jones-designed Queen’s House in Greenwich. The life-sized portrait, which is unusually presented in a landscape format, commemorates the failed invasion of England by the Spanish Armada in the summer of 1588. It was painted in about 1590 by an unknown artist when the queen was aged in her mid-50s and may have been commissioned by Sir Francis Drake, second-in-command of the English fleet assembled to defend England from the Spanish. Up until its £10.3 million acquisition (which was funded by various donations including a £1 million donation from the Art Fund, £400,000 from the Royal Museums of Greenwich, some 8,000 individual donations from members of the public totalling £1.5 million, and a Heritage Lottery Find grant of £7.4 million), it had been owned by Drake’s descendants – now known as the Tyrwhitt-Drakes – who have had possession since at least 1775. It spent much of its life hanging at Shardeloes, a Buckinghamshire country house built for William Drake in the late 18th century. Designed to inspire a sense of awe in its viewers, the portrait contains numerous references which would have conveyed specific meanings to the Tudor mind. The Queen’s upright posture, open arms and clear gaze, for example, convey vitality and strength while her pearls are symbols or chastity and the Moon. The gold suns embroidered on her skirt and sleeves are said to symbolise power and enlightenment and the queen rests her hands on a globe with her fingers seeming tapping on the new world with the imperial crown sitting overhead in fairly obvious statement of her ambitions overseas. Two maritime scenes in the background, both of which are actually early 18th century reworking over late 16th century originals, depict firstly the English fleet preparing to engage the Spanish Armada in the English Channel and, secondly, Spanish ships being wrecked on the Irish coast during their passage home. One of the best known images from English history, the portrait has inspired countless portrayals of Elizabeth on stage and screen, including Cate Blanchett’s in two ‘Elizabeth’ films. The Queen’s House, where the painting is being displayed, is built on the site of what was once Greenwich Palace, birthplace of Queen Elizabeth I. WHERE: Queen’s House, Romney Road, Greenwich (nearest overground station is Greenwich/DLR is Cutty Sark for Maritime Greenwich); WHEN: 10am to 5pm daily; COST: free; WEBSITE: www.rmg.co.uk/queens-house. • A new exhibition exploring how fashion survived and even flourished during World War II has opened at the Imperial War Museum in Lambeth to mark the 70th anniversary of the war’s end. Fashion on the Ration brings together more than 300 exhibits including clothes and accessories like the ‘respirator carrier handbag’, photographs and films as well as official documents from the period, letters and interviews. The exhibition is divided into six parts which examine in detail everything from the uniforms worn during the period to clothes rationing (introduced in 1941) and how the end of the war impacted fashion. Runs until 31st August. Admission charge applies. For more, see www.iwm.org.uk. • The UK’s first major exhibition devoted to Paul Durand-Ruel, the man who “invented Impressionism”, has opened at the National Gallery off Trafalgar Square this week. Inventing Impressionism features around 85 works including some of Impressionism’s greatest masterpieces, a number of which have never been seen in the UK before. The majority of the works were traded by Durand-Ruel (1831-1922) who is noted for having discovered and supported Impressionist painters like Monet, Pisarro, Degas and Renoir. Durand-Ruel purchased an astonishing 12,000 pictures between 1891 and 1922, including more than 1,000 Monets, about 1,500 Renoirs, more than 400 Degas’, some 800 Pissarros and close to 200 Manets. The images on display include a series of rarely-seen portraits of the dealer and his family by Renoir which are being exhibited in the UK for the first time as well as five paintings from Manet’s ‘Poplars’ series and all three of Renoir’s famous ‘Dances’, not seen in the country together since 1985. The exhibition finishes with a reference to an exhibition Durand-Ruel organised in London in 1905. Held at the Grafton Galleries, it presented 315 paintings. Admission charge applies. Runs until 31st May. For more, see www.nationalgallery.org.uk. • Gift Horse, New York-based German artist Hans Haacke’s sculpture of a skeletal riderless horse, will be unveiled on the Fourth Plinth in Trafalgar Square today. The horse, derived from an etching by English painter George Stubbs – whose works are in the nearby National Gallery, features an electronic ribbon tied to the horse’s front leg showing a live ticker of the London Stock Exchange. The statue, described as a ‘wry comment’ on the equestrian statue of King William IV which was originally to occupy the plinth, is the 10th to occupy the plinth since the first commission – Marc Quinn’s sculpture Alison Lapper Pregnant – was unveiled in 2005. • Contemporary artist Dryden Goodwin’s first feature-length film is on show as part of a new exhibition, Unseen: The Lives of Looking, at the Queen’s House in Greenwich. Continuing Goodwin’s investigations into portraiture, the newly commissioned film focuses on three individuals who have a “compelling” relationship to looking – eye surgeon Sir Peng Tee Khaw, planetary explorer Professor Sanjeev Gupta and human rights lawyer Rosa Curling. Alongside the screening is a series of drawings made by Goodwin after observing the three individuals as well as tools and papers related to each of their trades and a series of objects connected three leading observers related to the history of the Royal Museums Greenwich sites – John Flamsteed, first Astronomer Royal, Edward Maunder, who observed Mars from the Royal Observatory Greenwich, and the artist Willem van de Velde the Elder who made detailed drawings of naval battles in preparation for producing paintings in his studio at the Queen’s House. Runs until 26th July. Admission is free. For more, see www.rmg.co.uk. • It’s finally here. 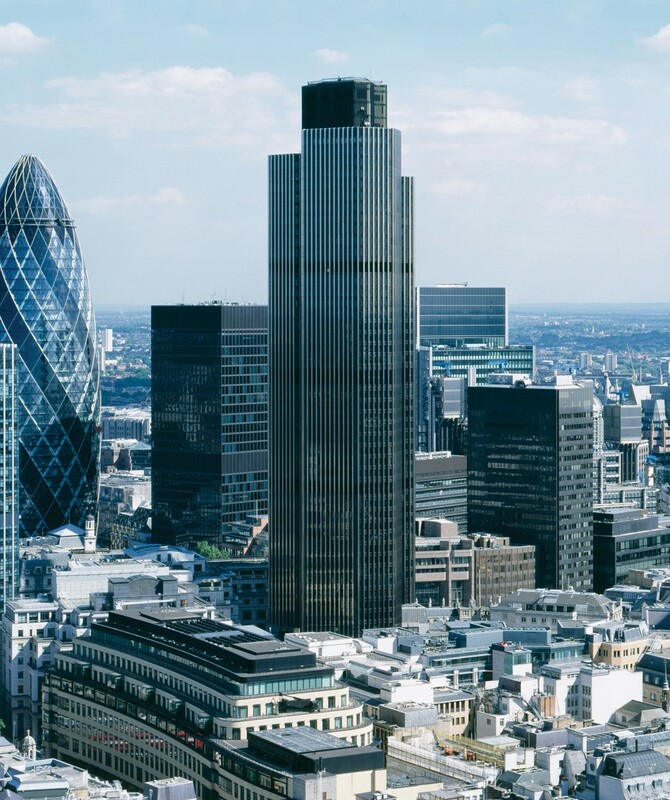 Open House London kicks off on Friday and with more than 800 buildings opening their doors, the only difficulty you’ll have this weekend will be choosing what you end up doing! This year’s theme is ‘celebrating architecture, people and place’ and among the highlights will be the opening of landmark structures like Battersea Power Station, Tower 42 (pictured), and the Gherkin (30 St Mary Axe) as well as 100 private homes, architects’ homes and “ground-breaking” housing developments and everything from the Shri Swaminarayan Temple in Brent to Horse Guards in Whitehall (certain buildings, like 10 Downing Street and The View from the Shard, are only open to people who won tickets in an earlier ballot). This year’s festivities also include a moonlit “culture crawl” through London on Friday night. If you haven’t ordered a hardcopy programme, you can check the listings online at www.openhouselondon.org. There’s also an Open House iPhone app available from the appstore. • A series of works by Yinka Shonibare – including some never before seen in the UK – went on display at Greenwich yesterday, thanks to Royal Museums Greenwich. The works, which explore notions of “Britishness, trade and empire, commemoration and national identity”, can be found inside and around buildings including the Queen’s House, National Maritime Museum and Royal Observatory and include Fake Death Pictures – a series of five vision of the death of naval hero Vice-Admiral Lord Nelson, Wind Sculpture – a gravity-defying object located on the Queen’s House lawn, Cheeky Little Astronomer – a specially commissioned sculpture located in the Flamsteed House at the Royal Observatory, and Nelson’s Ship in a Bottle – last seen on Trafalgar Square’s Fourth Plinth. Yinka Shonibare MBE at Greenwich, which is supported by a range of talks, debates and tours, runs until 23rd February. For more, see www.rmg.co.uk. • Bankside will be transformed this weekend as artists will be transforming disused hoardings and derelict buildings with original artworks as part of the Merge Festival. The work’s include Candy Chang’s Before I Die, Alex Chinnick’s Miner on the Moon, and Marcus Lyall and Mark Logue’s House of Pain. Until 20th October. For more on the festival celebrating Bankside, see www.mergefestival.co.uk. • On Now: Michael Peto Photographs: Mandela to McCartney. This new exhibition at the National Portrait Gallery just off Trafalgar Square features a previously unexhibited photo of Elizabeth Taylor and Richard Burton, taken at the beginning of their love affair. It’s one of 10 portraits taken by the late Hungarian-born photographer Michael Peto in London during the 1950s and 1960s – others feature Samuel Beckett, Jennie Lee, Paul McCartney and Ian McKellen. Admission is free. For more, see www.npg.org.uk. • A new exhibition on the work and legacy of John Snow – who traced the source of a deadly cholera outbreak in the 1850s to a Soho water pump – opened at the London School of Hygiene and Tropical Medicine this week. Cartographies of Life & Death – John Snow and Disease Mapping – part of a series of events planned for the bicentenary of Snow’s birth – features both historical treasures, such as disease maps from the school’s archives, and new artworks inspired by science with the entire display presented as a disease mapping ‘detective trail’. There will be a pop-up water bar and street lectures and performances. Snow (1813-1858) is considered the founder of modern epidemiology, the study of patterns and causes of health and disease in populations. His work remain influential even today. Admission is free. The exhibition runs until 17th April at the school in Keppel Street. For more, see www.johnsnow.org.uk. • A new installation at the V&A opening on Saturday will explore the rise – and fall – of the music hall. Music Hall: Sickert and the Three Graces picks up on artist Walter Sickert’s obsession with the New Bedford Music Hall in Camden Town and features film, music and objects presented in a ‘theatrical narrative’ which focuses on the world of the Edwardian Music Hall. Highlights include filmed extracts of Tanika Gupta’s specially produced play The Boy I Love (directed by Katie Mitchell) which takes its name from George Ware’s celebrated music hall song The Boy I Love is Up in the Gallery. Admission is free. The exhibition, which is in the Theatre and Performance Galleries of the V&A, runs until 5th January next year. For more see www.vam.ac.uk. • Three specially commissioned artworks by British textile artist Alice Kettle will be unveiled today at the Queen’s House in Greenwich. The Garden of England – Royal Museums Greenwich’s first contemporary arts program – features Flower Helix (hanging in the Tulip Stairs), Flower Bed (a “textile garden” found in the North West Parlour), and Queen Henrietta Maria (a stitched portrait of the wife of King Charles I also found in the North West Parlour). The display is accompanied by a program of events – for more on them, see www.rmg.co.uk. Entry is free – the exhibition is on show until 18th August. • On Now – From the Shadows: The Prints of Sydney Lee RA. This exhibition at the Royal Academy represents a reappraisal of the work of painter-printmaker Sydney Lee (1866-1949) and features more than 50 prints and two major paintings. Lee studied in Manchester and Paris before coming to London where he lived in a house and studio in Holland Park Road in Kensington. He was elected a Royal Academician in 1930 and served as Treasurer from 1932-1940. The first exhibition devoted to his art since 1945, the event coincides with the publication of the first book on Lee written by its curator Professor Robert Meyrick, head of the School of Art at Aberystwyth University. Runs until 26th May. Admission charge applies. For more, see www.royalacademy.org.uk. The oldest of the royal parks, the 74 hectare (183 acre) Greenwich Park has been associated with royalty since at least the 15th century. The area covered by the park had been occupied by the Romans (there are some remains of a building, possibly a temple, near Maze Hill Gate) and later the Danes, who raised protective earthworks here in the 11th century. After the Norman Conquest, it became a manor. Its enclosure only happened in 1433 after the land came into the possession of Humphrey of Lancaster, Duke of Gloucester and brother of King Henry V. At the time regent to the young King Henry VI, Duke Humphrey also built a tower on the heights above the park – where the Royal Observatory now stands. Following the duke’s death in 1447, the land was seized by Margaret of Anjou – wife of King Henry VI – and subsequently became known as the Manor of Placentia. King Henry VII later rebuilt the manor house, creating what was known as Greenwich Palace or the Palace of Placentia. Not surprisingly, it was King Henry VIII, who, having been born at Greenwich Palace, introduced deer to the park. Indeed the park was to have strong associations with others in his family – the king married Catherine of Aragorn and Anne of Cleeves at Greenwich Palace, and his daughters, later Queen Mary I and Queen Elizabeth I, were born there while his son, King Edward VI, died there in 1553 at the age of only 15. (There’s a tree in the park known as Queen Elizabeth’s Oak, which is said to be where she played as a child). In 1613, King James I gave the palace and accompanying park – which he had enclosed with a high wall – to his wife, Queen Anne of Denmark, apparently as an apology after swearing at her in public when she accidentally shot one of his favorite dogs. Queen Anne subsequently commissioned Inigo Jones to design what is now known as the Queen’s House – for more on that, see our earlier post. Following the Restoration, King Charles II ordered the palace rebuilt and while this work remained unfinished, the king did succeed in having the park remodelled – it is believed that Andre Le Notre, gardener to King Louis XIV of France, had a role in this. The works included cutting a series of terraces into the slope – these were known as the Great Steps and lined with hawthorn hedges – as well as creating a formal avenue of chestnut trees (now known as Blackheath Avenue), and some woodlands. Work is currently taking place on restoring an orchard which dates from 1666 at the park. King Charles II also commissioned Sir Christopher Wren to build the Royal Observatory that still stands on the hill overlooking the park – it stands on the site once occupied by the Duke Humphrey Tower (the Royal Observatory is home of the Prime Meridian – see our earlier post on the Royal Observatory for more). King James II was the last monarch to use the palace and park – his daughter Queen Mary II donated the palace for use as a hospital for veteran sailors and the park was opened to the pensioners in the early 1700s. The hospital later become the Royal Naval College and the National Maritime Museum later moved onto the site (for more on this, see our earlier post). As an aside, Royal Parks say the truncated shape of some of the trees in the park is apparently due to the fact that when anti-aircraft guns were positioned in the flower garden during World War II, the trees had to be trimmed to ensure a clear field of fire. Facilities in the park today include a tea house, a children’s playground, sporting facilities such as tennis courts and, of course, the Wilderness Deer Park where you can see wildlife at large. Statues include that of Greenwich resident General James Wolfe, an instrumental figure in establishing British rule in Canada – it sits on the crest of the hill opposite the Royal Observatory looking down towards the Thames. 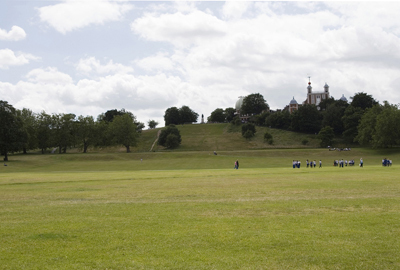 The park, which is part of the Greenwich World Heritage Site, is slated as a venue for next year’s Olympics – it will host equestrian events and the shooting and running events of the pentathlon. This is the third in our series in which we ask you to identify where in London this picture was taken and what it’s of. If you reckon you know the answer, leave a comment below. We’ll reveal the answer early next week. Good luck! Apologies for the delay in getting this answer to you (Exploring London has been on a summer break!). 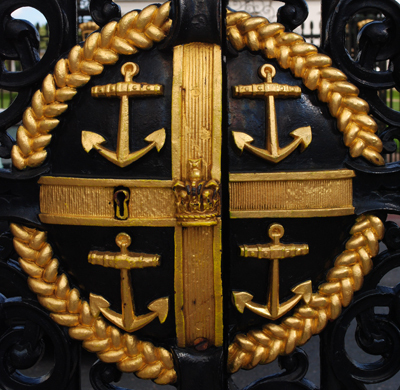 But if you’ve been wondering, the answer is that the picture shows a lock detail from one of the gates leading into the old Royal Naval College at Greenwich – the anchors were a clue! 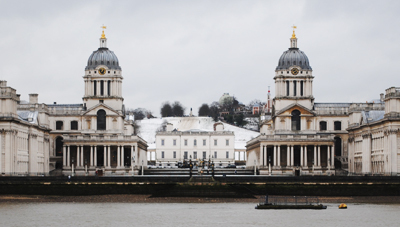 Congrats to Ian who guessed the location was near the Queen’s House (contained within the former Royal Naval College). Click here if you’re interested in reading our previous entry about the former Royal Naval College and Sir Christopher Wren’s role in its design. “When I was a child my grandparents took me to Greenwich for the day. I remember being very impressed with Admiral Nelson’s uniform (complete with blood stains) and the haunted tulip staircase in the Queen’s house. While we sat and ate cheese and onion crisps in front of the Cutty Sark, my Grandmother (who was a little eccentric) told me ‘there is so much history here you can feel it’. “So what can you see in Greenwich today? 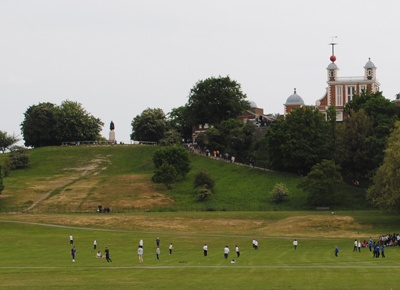 “You can visit the Greenwich Observatory, stand on the Meridian line and know you are in the centre of the world! 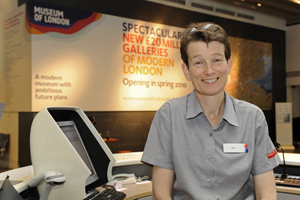 Admission is free there, as well as the National Maritime Museum and the Queen’s House. You can also see the magnificent Wernher collection at Ranger’s House (free to members of English Heritage) and don’t forget the tiny Fan Museum. “A favourite lazy Sunday morning, includes a stroll in the Royal Park to visit the deer enclosure, a leisurely coffee in one of the two cafes and a visit to the craft market. “The remains of a Roman villa can be seen in the park and you can visit Princess Caroline’s bath. Don’t miss Queen Elizabeth’s oak, Henry VIII is reputed to have courted Anne Boleyn under the boughs of his ancient hollow tree. It fell during high winds in the 1990’s and is now slowly rotting away. “Look down from the Observatory Gardens upon the magnificent Royal Naval College and go to visit the beautiful painted hall. Remember, beneath the college lie the remains of the Royal Palace of Placentia, birth place of Henry VIII and Elizabeth I. “It is easy to get to Greenwich by over ground train, DLR or (to really pick up the atmosphere) by river boat. Hunkering down on the south bank of the Thames, the Old Royal Naval College at Greenwich is yet another Wren masterpiece and the centrepiece of the UNESCO-listed Greenwich Maritime World Heritage Site. What is now known as the college was originally designed as a ‘hospital’ or retirement home for old or infirm sailors. Established by Royal Charter in 1694, it was King William III who pushed the project into fruition as per the wishes of his then late wife Queen Mary II. Wren was selected to design the building and along with the diarist John Evelyn, who had been appointed treasurer, laid the foundation stone on 30th June, 1696. Wren’s initial design – for a three side courtyard facing the river – was rejected by Queen Mary who insisted the view from the existing Queen’s House to the river be maintained. So, instead, the hospital was built as a series of four pavilions, each with its own court, with the Queen’s House standing as it’s centrepiece when viewed from the river. Wren himself never lived to see the building’s completion – it was in the end completed by a number of other famous architects including Sir John Vanbrugh, Thomas Ripley, and Wren’s pupil Nicholas Hawksmoor. Fortunately Wren had laid out all the foundations which ensured the basic design conformed to his plans. The first 42 pensioners moved in in 1706 and the numbers grew as buildings were completed to a peak of 2,710 in 1814. However, declining numbers of pensioners by the mid 1800s – thanks to a period of peace on the seas and the success of a program which saw more pensioners living with their families, eventually led to the hospital’s closure in 1860. In 1873, the Royal Naval College took over the premises, assuming the role of both the former Naval College at Portsmouth and the School or Naval Architecture and Marine Engineering which had been based in South Kensington. The Naval Staff College opened on the site in 1919 and further navy departments including the Department of Nuclear Science and Technology moved there in later years. The Royal Navy left the college in 1998. Now in the care of the Greenwich Foundation, the college is now used by the University of Greenwich and the Trinity College of Music as well as for public events. The public can also visit certain parts of the former college including the grounds, the spectacular Painted Hall and the Chapel. The domed Painted Hall, which features a series of classically themed paintings with King William III and Queen Mary II at its heart, was originally planned by Wren to be the hospital’s dining hall but due to the length of time it took for Sir James Thornhill to complete – 19 years – his paintings it was never used as such. Instead it stood empty until the body of Admiral Lord Nelson was brought there to lie in state in January 1806. In 1824 it became the National Gallery of Naval Art but in the 1930s became a dining room again with the gallery’s contents transferred to the National Maritime Museum. The Chapel of St Peter and St Paul, meanwhile was completed in 1751 to the design of Sir Thomas Ripley but was gutted by fire only 28 years later. It was then rebuilt, largely to the designs of James “Athenian” Stuart with some of the detailing designed by his Clerk of Works William Newton, and was reopened in 1789. Restored in the 1950s, it is said to look “almost as it was” when it opened in 1789. The chapel is still in use for services.